January 2018 – Ts’elxwéyeqw Tribe Management Ltd.
S’ólh témexw te íkw’ eló. Xólhmet te mekw’stám ít kwelát. – This is our land. We have to look after everything that belongs to us. 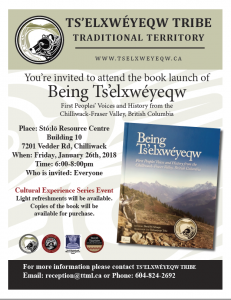 Out of respect for a recent loss in the community, the launch of Being Ts’elxweyeqw” – First Peoples’ Voices and history from the Chilliwack- Fraser Valley, British Columbia scheduled for the evening of January 26, at the Sto:lo Resource Centre, has been postponed. The books will be available for sale at the Sto:lo gift shop as of Saturday, January 27. We look forward to hosting this event in the near future and will share the new date as soon as possible. Light refreshments will be available, and copies of the new book will be available for purchase.